Does a special child in your life love Beander’s? Let us know! You and your child can win Beander’s Bucks to use toward your next family meal with us! To enter our Kids Love Beander’s Contest, submit a photo of your child at Beander’s along with a brief statement about what your child likes about Beander’s. Include your photo along with a short message in your child’s own words about what they like to eat at Beander’s, why they like it here, or whatever he or she wants to share. Submit your entry by email right here on our website. Multiple winners may be chosen and we may feature your entry on our Facebook page. Enter as many children as you like! No purchase is necessary to enter. A purchase will not improve your chance of winning. 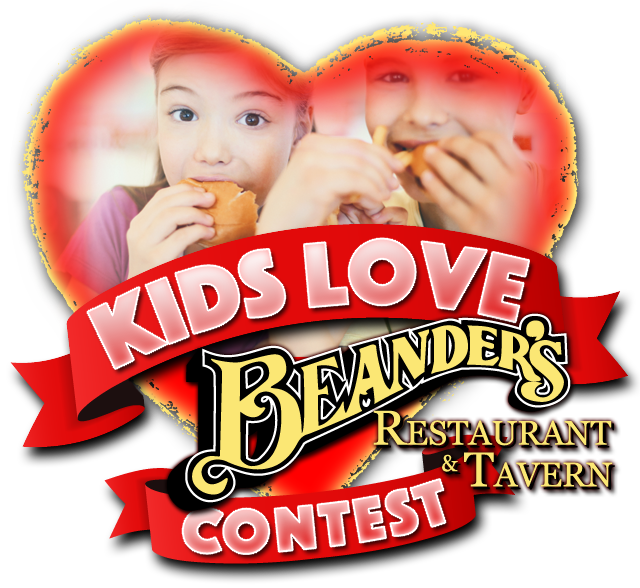 To enter, log onto https://beanderswv.com/contests and click on the “Enter Kids Love Beander’s Contest” logo to complete and submit the registration form along with your child’s short essay and a picture of your child at Beander’s Restaurant & Tavern. Multiple entries from each family will be accepted. This is an online contest. All entries must be submitted online via Beander’s Restaurant & Tavern’s website. All entries submitted become the property of Beander’s Restaurant & Tavern. Beander’s Restaurant & Tavern cannot be held responsible for lost, incomplete, damaged, illegible, late, or misdirected entries, or for errors in mechanical transmission, technical or wireless difficulties, or the inability to transmit Internet entries. Beander’s Restaurant & Tavern reserves the exclusive right to cancel or extend the contest if an insufficient amount of entries is submitted or technical difficulties arise. After all submissions have been received, several entrants will be selected as winners. If the selected winner is determined to be ineligible for any reason or cannot be reached, another winner may be selected. Multiple prizes will be awarded consisting of Beanders Bucks to be used toward food purchases for the winning child and his or her family at Beander’s Restaurant & Tavern. The winner is solely responsible for any federal, state, and local taxes, as well as any fees related to the acceptance of this prize. Prizes can be claimed during normal business hours at Beander’s Restaurant & Tavern: 314 Davis Avenue in Elkins, WV 26241.